Pratt Industries continued its rapid expansion in the Northeast last week, with the official opening of a new, $35 million box plant outside Allentown, Pa. Governor Tom Corbett and former Pittsburgh Steelers great Mel Blount were among those attending the celebration in Macungie. “I’m extremely proud that we now have more than 50 factories in the U.S. and that we continue to add more and more green-collar jobs here,” said Pratt Chairman Anthony Pratt. Pratt also recently acquired two other companies – Impress Packaging and Rock Solid – to solidify its expansion into the Keystone State. “Our company motto – harvesting the urban forest – is gaining traction in the U.S. and as we expand, we’re making a real difference in communities like this throughout the country,” he said. “Anthony Pratt is a great example of the kind of business leadership that is growing new jobs and great opportunities in Pennsylvania,” he said. The 340,000 sq. ft. facility employs more than 100 people and is anchored by a 110” BHS corrugator and multiple finishing machines. 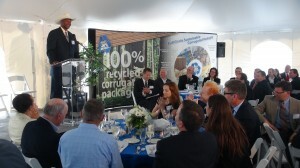 NFL great Mel Blount addresses customers at the grand opening of Pratt's newest box plant. 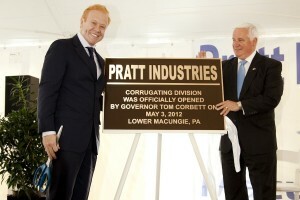 The Macungie opening comes just 12 months after Pratt launched a similar facility in Fort Worth, Texas, and just six months following the official opening of a clean energy plant at its corporate campus in Conyers, Ga.
Pratt is now America’s 5th largest box maker with operations in more than 20 states.